47 RS Aeros are greeted by the arrival of Spring at Oxford! What a weekend! An incredible 47 RS Aeros entered The Oxford Blue which included the 2017 RS Aero UK Winter Championships. We had seen fleets of about 40 at events in the late autumn but we would never have anticipated 47 in February with so many committing a long way in advance! The wind was light and inevitably there were challenges around the course. However with a nice 5-10 knots there was always good racing to be had with occasional hiking and even the odd moments of planing! The mild late February weather compensated admirably. The RS Aeros packed out the middle start with almost a third of the total 147 boat entry. Wind shift and pressure chasing were the game of the day, together with the ability to exit the start line in good shape. With such a fleet there was competition throughout and always opportunities to be spotted and taken on each leg. In Race 1 Peter Barton (Lymington) overtook Peter Chaplin (Burghfield) to win the RS Aeros. David Ellis (Lymington) was first RS Aero 7 with Hannah Snellgrove (Lymington) 2nd. Emily Davis (Great Moor) came in first in the RS Aero 5s. Race 2 was the biggest RS Aero success with 6 RS Aeros in the top 12 overall from the 135 starters! Liam Willis (Lymington) led the RS Aeros home taking a brilliant 3rd overall in the race with Chris Larr (Northampton) close behind in 5th overall. First RS Aero 7 was 49er helm Nick Redding (Goring) in 10th overall and Alice Lucy (Rutland) finished first RS Aero 5. The RS Aeros struggled more in race 3, but this time the RS Aero 7s faired very well against the 9s. After a warp speed start off the favoured end our coach, Paul Robson (Reading), in his RS Aero 7 never looked back keeping pace with the lead 9s to take the yardstick win in the RS Aeros. Top RS Aero 9 this time was RS Sailing’s Ben Rolfe 9Burghfield) who narrowly pipped Liam. Emily was ahead again in the RS Aero 5s. 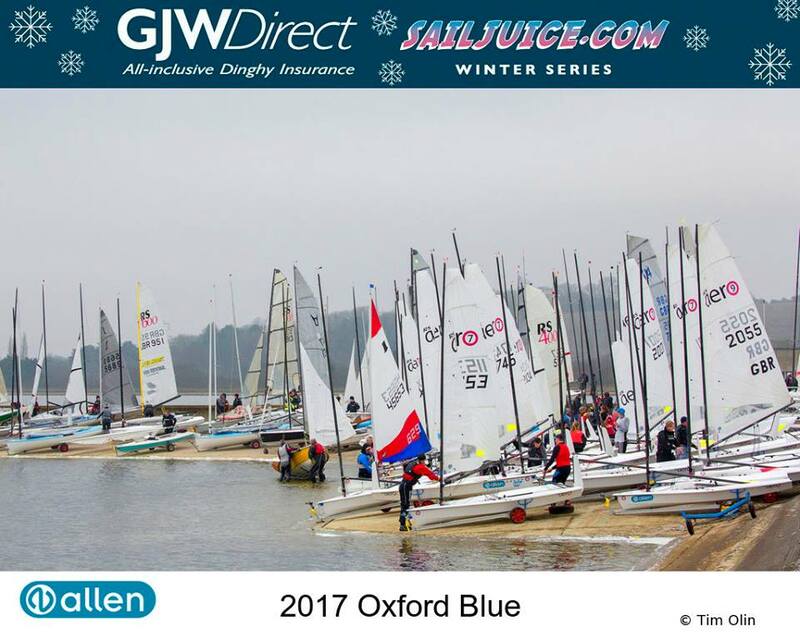 Overall in The Oxford Blue Peter Barton was lead RS Aero and the first boat of the middle ‘B’ start in 15th, just ahead of Peter Chaplin. Paul Robson was first RS Aero 7 and Emily Davis lead RS Aero 5. For the RS Aero UK Winter Champs we take the RS Aero results out from each race which leads to similar, but slightly different, results once you remove all the other classes who finished in between the RS Aeros on corrected time. In an incredibly tight finish the RS Aero Winter Championship was won by a point by 16 year old Liam Willis giving a very mature display of skill in the tricky conditions. If Liam can now win in light conditions we are all in trouble, we already know he is fast when it is windy! Just a point behind was a three way tie with Peter Barton sneaking it from Peter Chaplin and then Chris Larr. In the RS Aero 7s Paul Robson ended top of the pile. A great performance by Lucy Greenwood (Oxford) (has team race training sharpened her game?) gave her 2nd with current RS Aero 7 National Champ, David Ellis, having to settle for 3rd on this occasion. Emily took the RS Aero 5s, with Alice and Natasha not too far behind. Top Lady was Lucy Greenwood and top Master Peter Chaplin. Naturally top Youth was Liam Willis! Lymington Town SC topped the Club competition with Liam showing the way to the old blokes, rather than playing anchorman this time! It was fantastic to see Andy Rice, the founder of the SailJuice Series, out in an RS Aero having fun. He was improving in every race and perhaps just needed a couple more! Hannah Snellgrove was on the water as part of the coaching team passing on help before racing and between races to those enrolled on the following day’s training. 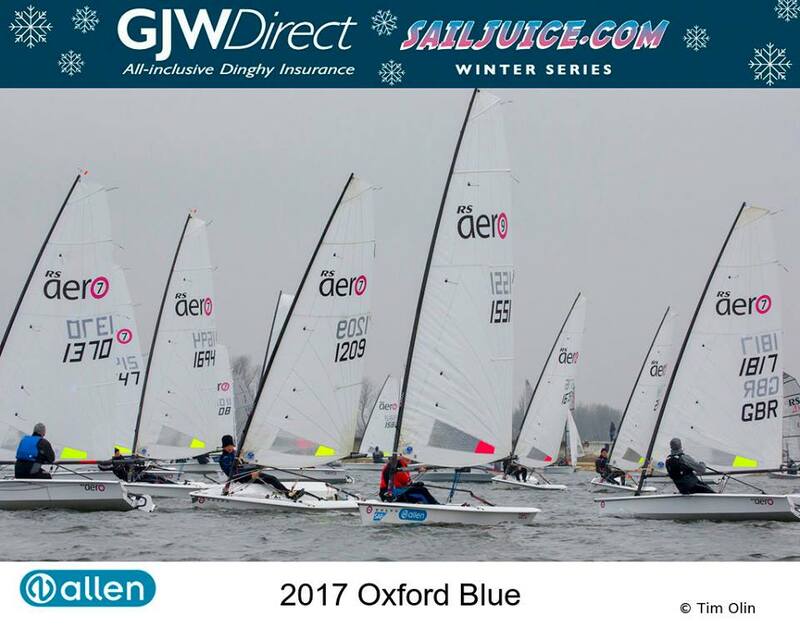 On the Sunday nineteen of the RS Aeros stayed at Oxford for our monthly Winter Training with Hannah Snellgrove and Paul Robson coaching the day and Ben supporting. 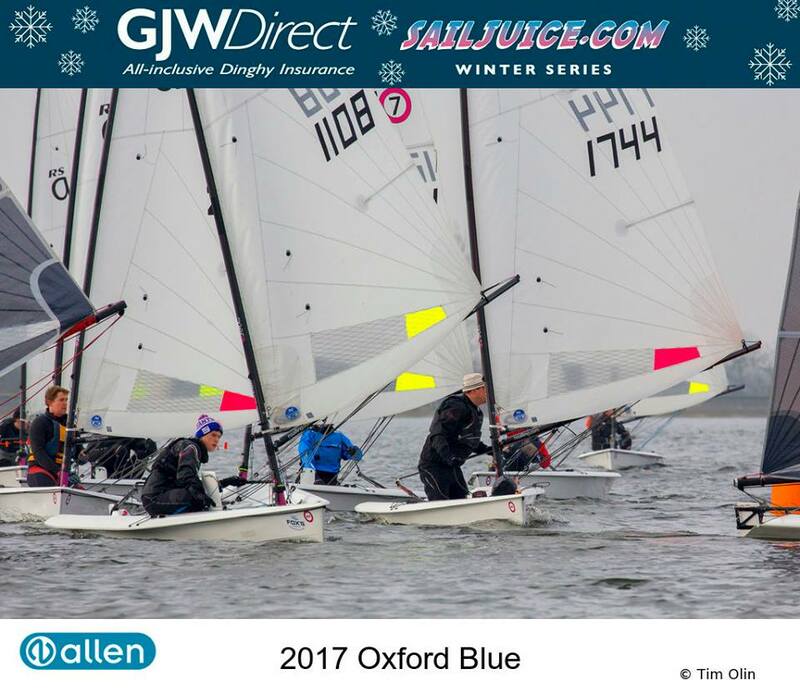 Thanks to Oxford SC, SailRacer and SailJuice for a great event and another fantastic SailJuice Winter Series. Spring is here and after a calm winter we can turn the fans back on now! 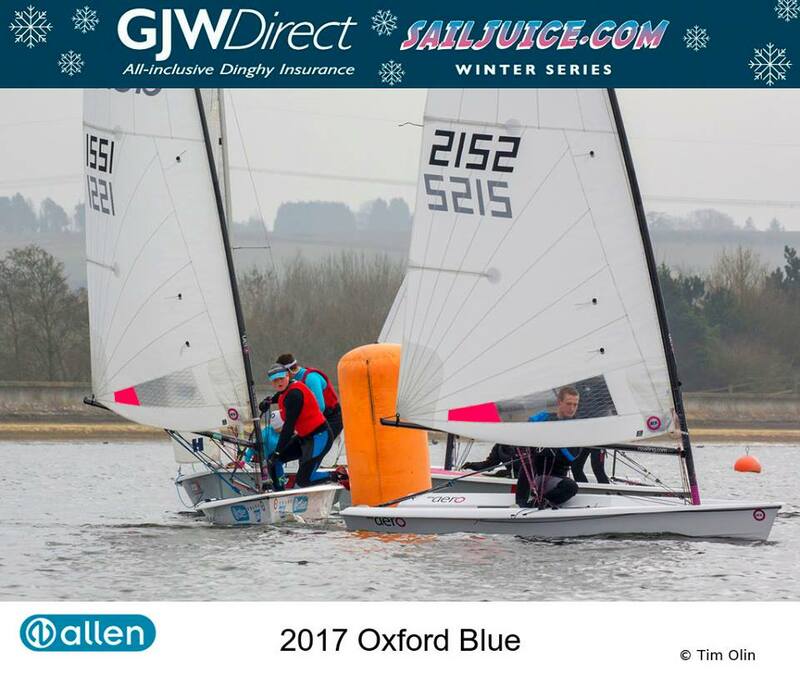 The Oxford Blue was also Round 7 of the RS Aero Winter Series. The next round is this Sunday at Devon’s Roadford Rocket with about 10 RS Aeros already committed. Then the Exmoor Beastie is at Wimbleball SC and the grande finale is the RS Aero UK Spring Champs at Island Barn Res SC, both in March.